Opening festivities are beginning in South Africa for the FIFA World Cup soccer/football championship. The GIS Research & Map Collection (GRMC) in Bracken Library has created a special exhibit commemorating the competition. Visitors can view the National Geographic Soccer Unites the World map, which features a map detailing World Cup participant nations, players, a historical timeline and statistics about the sport. The verso of this map is also displayed, showing the rules of the game. The GRMC created a special map for the 2010 World Cup. 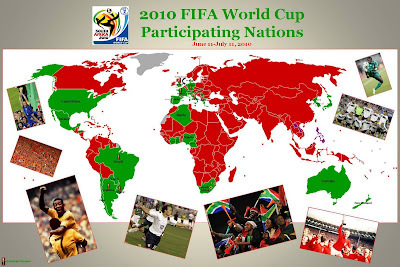 This map identifies the 32 qualifying nations and marks the previous winning teams. The map displays photographs of players and fans from past competitions, including Pele’ of Brazil and Bobby Moore of England. The map will be exhibited in the windows of the GRMC on the second floor of Bracken Library through the duration of the World Cup, ending on July 11. For more information about special maps from the GRMC, please contact the staff at 765/285-1097.